"Look out!" the wheelchair technician said, as I crashed into the wall. 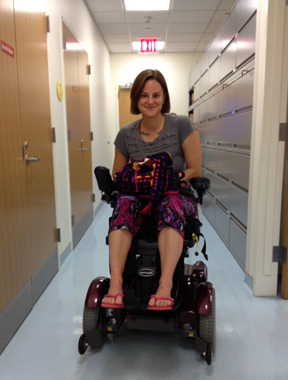 How could I have known how difficult it is to drive an electric wheelchair -- until I was test-driving my own? "Oh God, please tell me this not happening," I thought -- ramming into the opposite wall in reverse. My test-drive was quickly becoming a slapstick comedy show for everyone in the waiting room. This look is so not me, I wanted to say, as if trying on an outfit in a dressing room. Because I am not the girl in the wheelchair. I'm the crazy ballerina. The kickin' capoeirista. The all-state 3rd base. The rockin' climber on the face. The whirling dervish -- wandering 'round the world. Seriously, people, no need to stare -- I am not the girl in the wheelchair. Only, I was the girl in the wheelchair, and I was no natural at maneuvering my hefty wheels through those narrow hospital halls. Get me off this amusement park ride, I wanted to say, and let's end this game of pretend. Because there was no way I could accept that I might never walk again. How I found myself in that chair is a novel in itself -- a tale too long to tell. But my surgeons had given me a choice: become mummified in a body cast for six months -- after a gruesome and risky surgery -- or make peace with a life on morphine and wheels. Geesh, talk about a choose-your-own-adventure. "But what about alternative medicine?" I asked my doctors, skeptical of it myself. "Try anything you've got," they said, since there was nothing more they could do. And so, with their permission, and perhaps by grace, I was led -- by a bizarre set of coincidences and at no expense of my own -- into the healing hands of a Masai medicine man, a Siberian shaman, a Chinese acupuncturist, and a Turkish Sufi sage. While this sounds like the set-up for a joke -- how many healers does it take -- it was anything but. 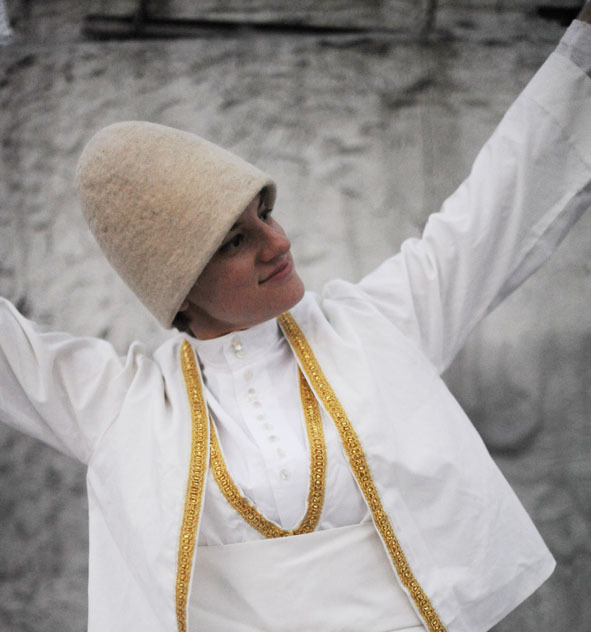 Over the course of a year, while dervishes delivered dinners and Access-A-Ride shuttled me around, I placed my whole being -- and any hopes I had left -- in their caring trust. I let them massage me, rub rocks on me, spit on me, put pins in me, pray for me, and interpret my dreams. As broken as a body and soul can be, I prayed it would all end in a miracle. And it did. With their mystical brew and by an unknowable alchemy, I was eventually able to stand again on my own two feet -- to the surprise of everyone (except my mother, who never gave up hope). For this small miracle, which took a village (well, several), I whispered thank you in my heart with every step -- though I doubted if I would ever whirl again. "Whirling is like the sun, moon, stars, galaxies and world all turning around themselves -- everything in this universe is whirling -- everything, and every particle, revolves," a Turkish Sufi sheikh once said to me -- years before in Istanbul. But the whirling of the dervishes, he explained, is different -- because it is a conscious attempt to be in harmony with all things in nature. 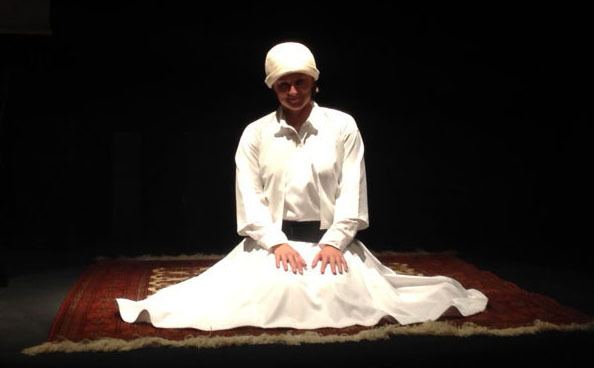 Since whirling is more than just a dance, the sheikh wouldn't teach me the whirling ritual of Rumi, until I had proven myself in meditation and service on a forty-day retreat. When he finally taught me how to revolve 360 degrees with each step -- while inwardly repeating Arabic in my heart, I struggled to empty myself completely, and turn only with love -- for love. Eventually, however, I learned how to stop turning -- and let myself be turned. Once I felt the gentle push of that invisible hand, there was no stopping me. Well, until I found myself in that wheelchair, bumping into walls. But that dreadful day -- and the many that followed -- are all in the past. Because this week, I found myself whirling in Beirut -- a dream come true, but a dream I never dreamt. When I moved to Lebanon last year, I still felt too wobbly to whirl -- but I wanted to pass it on. 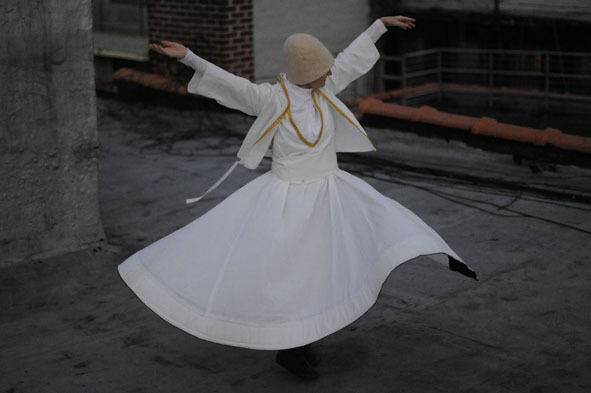 So I taught some Lebanese Sufis how to whirl, hoping they might whirl for me. But as I grew stronger -- bless those daily swims in the sea -- I was invited to whirl for a Ramadan concert in Beirut. Though the floor of the stage wasn't ideal -- I didn't freak out. And before the show started, I heard gunshots outside -- but I wasn't afraid. Under the rising red moon of Ramadan, I began turning like a shimmering dust devil on a carpet I was hoping might fly. But since the spotlight cue was late, I was whirling in the dark. And though I almost spun out, I didn't really care -- because I was whirling, nonetheless. When the spotlight finally came on, I was back to whirling on my axis. And I could finally see -- that I'm no longer whirling for perfection. I'm whirling for the girl in the wheelchair -- for those who cannot. And for the gunshots. For the peace-makers and war-makers, the rich and the poor, the young and the old, the dead and the not yet born. I'm never whirling alone -- but with the whole world -- and with you. All of us -- awake and asleep -- whirling through the heavens -- even when we're still. Before, I used to whirl to impress. Now, I whirl because I'm broken. I whirl because I can. I whirl because I'm free. I whirl because I'm alive. Be you man or woman, plant or animal, slave or free. I shall show you the brilliant crystal fires, shining within. I shall show you the path beyond Heaven.